Getting clearer, healthier skin could soon be as easy as taking a selfie. At CES 2018 in Las Vegas on Tuesday, Lulu Lab — a member of the Samsung-C accelerator program — showed off its novel skincare camera designed to capture and analyze facial features with a single picture. Dubbed the Lumini, the system uses a multispectral camera to see below the surface of your skin and more accurately diagnose a variety of potential issues including wrinkles, acne, melasma, and pore size. 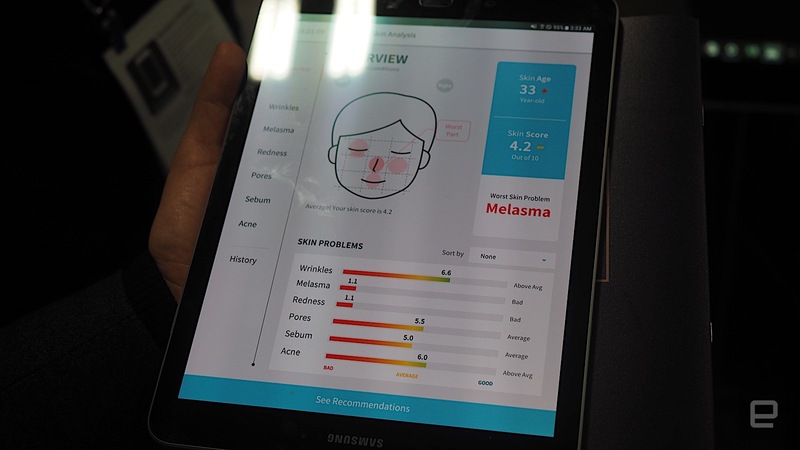 AI software, running on a mobile device, then grades your face, highlights trouble spots and recommends skincare products to address them. The Lumini is being marketed for B2B and will be available at cosmetic counters worldwide starting this summer.